Your Daily Cute: Today is National Get a Pal for Your Pet Day! For the longest time, Pimp was an only child. Then Moo came around and turned our world upside down. That little menace just bullied his way into my heart and Pimp's favorite spot on the bed -- and life is so much better now that it was before! That's why we love today. It's National Get a Pal for Your Pet Day, sponsored by P.A.L., or Pets Add Life. Because they do add life to our lives. Lots of it. I can't imagine only having one cat now. In fact, today Moo had to go on a little staycation for a couple hours. My landlord was going to come by to drop off the lease for next year and check the place out, and I'm only supposed to have one cat. So, I packed Moo and his food bowls up and he went to stay at a friend's for a couple hours. And I was miserable! And secretly, Pimp was, too. He tries to act like he doesn't like Moo, but I know he really does. He enjoys the company and having another cat around. I'm gone all day for work all the time, and this way they at least have each other around! Plus, Moo keeps Pimp in shape and young. They chase each other around the house like crazy! Sometimes I think I have buffaloes instead of cats. I wonder what the people below me think. No matter! Pimp is burning calories, thanks to Moo, and that makes his life better! --They get more toys! Twice as many even, if they're lucky. --They get more treats! Pimp always picks up Moo's scraps. --They get more exercise! It takes two to chase. --They get more love. Sneaky Moo loves to give Pimp a little lick every now and then. --They get more company. There's always a best friend around. Pimp would not like me sharing this... but I have proof that they love each other. So what are you waiting for? There is somecat or somedog in a shelter somewhere just waiting for you to bring them home so they can make both you and your pet's life better! I don't see landlords restricting tenants to one cat. Everyone must know every creature needs a pal, a playmate, another some body to keep company with. It just isn't right to my way of thinking. Having a pal for that one special little one is the right thing to do. Would you want to be all alone all day and not have someone to keep you company, play with you, cuddle with you ...... all those things? I kinda think not. We here at Five Oaks Manor have 4 insiders and two outsiders, and even though the house is crowded there is no way any one little cat could be happy alone as they are now. Even the fights are more fun when there's someone you can fight with. Y'all common, add a Pal for your little Pal today. Great post and Oh so true. Any animal is happier with a friend. It does make a big difference. 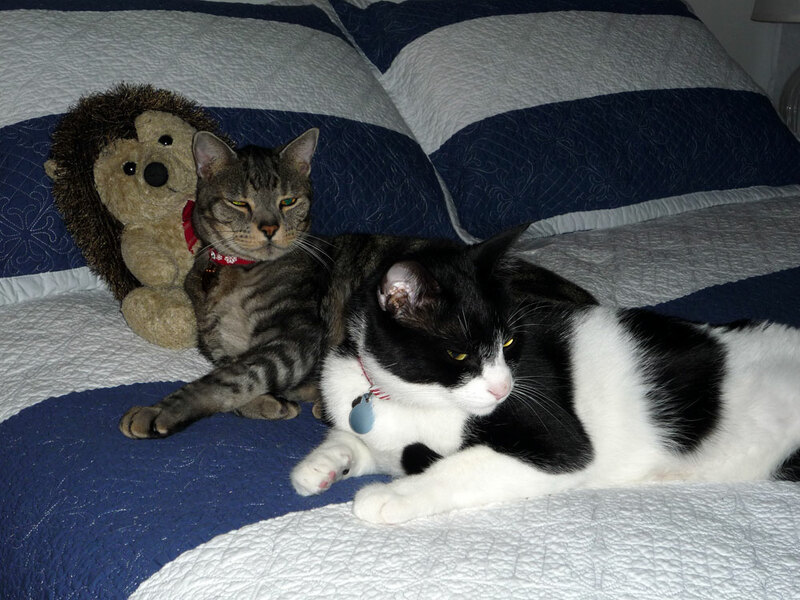 Even our cat Mewmew likes to have a friend every now and then. Great video. The video is adorable. I have two littermate sisters, and while they are totally opposite personalities, I know they're happier having each other. And I, too, have the heard of buffaloes with just 8 kitty paws. Great post! ha, besties for sure! Such a cute video! That was adorable. For 10 years Missi was an only child, then Idabelle was brought to me - she was six months old and could fit in the palm of my hand. Idabelle bullies her way into everything, even kicks her sister off mommy to get her way, but Missi still rules the house. Both of my girls were abused babies who are now both spoiled rotten and loved dearly. Rescued babies are the best. Cappuccino exparianced this last June when I had Brutus, his friend put down. She was lonely and moped around the house for a good month or 5 weeks. Then Beverly Animal Shelter, Cappuccino's old stomping ground offered up some Mocha and he has been happy ever since. Now both are sleeping on my bed as I type this.